This week I'm pleased to welcome back HoudahSpot as a sponsor. Apple’s Spotlight search is a powerful tool. But imagine if there were a group of engineers at Apple that wanted to turn up the Spotlight search a notch or two and had nobody in management to tell them "no". That's what you get with HoudahSpot. HoudahSpot is like Spotlight, but better in every way. 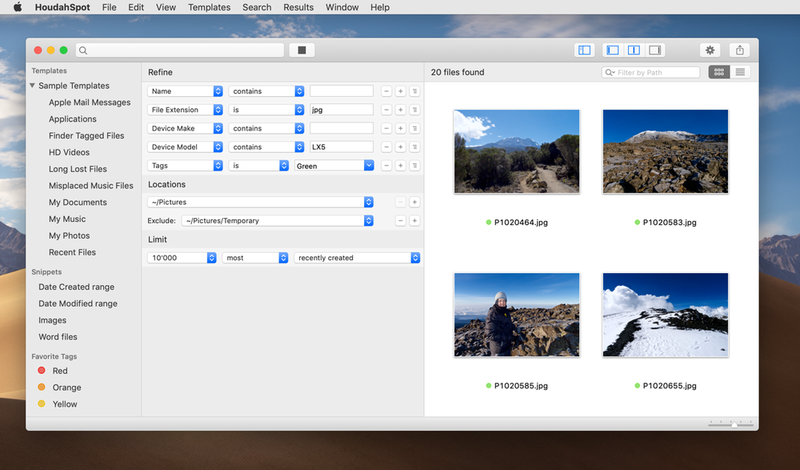 It improves upon Spotlight to let you find files by multiple criteria, like name, text, content kind, author, recipient, and pixel count to name a few. You can combine these search criteria to drill in quickly and choose which locations HoudahSpot looks in and which locations it ignores. Need to find every file that includes the name “bumfuzzle” but also includes the word “cumquat” in the text and was written in 2017? HoudahSpot can do that for you. You can even set up templates for repeat searches. I've used HoudahSpot for years and if you haven't tried it yet, you should. The thing about HoudahSpot is that with all of that search criteria, it’s just faster. It’s faster than a Finder search, it’s faster than a Spotlight Search, and it’s faster than a Siri search. I’ve not found any easier way to laser in on just the files you want. With HoudahSpot you can find a needle in a haystack. Anyway, don't take my word for it, go try out the app. If you like it, you can get 20% off with the coupon code MACSPARKY2019 or purchase through this link. There's no better way to search your Mac.